Halo 2 Anniversary Master Chief Prototype Toy?! Earlier today HaloWaypoint began tweeting out photos of some toys at this year’s Toy Fair in New York. Among the photos, 2 of them were of prototypes from the popular McFarlane Toys. The first being a prototype Master Chief figure modeled after the Halo on Xbox One trailer that we’re all very familiar with. Complete with a cloak and a promethean boltshot. In regards to this photo, there isn’t much to say. The real story lies within the second photo; A photo of a Halo 2 Master Chief prototype. So here we are again, it feels like 343 is teasing us. I would just like to point out that this isn’t some old left over toy from 2004. McFarlane toys didn’t start making Halo toys till after Halo 3’s launch. Prior to this, Joyride was making Halo toys (most notably the one used for the famous Arby ‘n’ the Chief Machinima series). This figurine begs the question. Why make one for a game that’s over 10 years old? GameZone stands by the statement that was published and not the altered one submitted by Microsoft’s “impression” of what Downes told GameZone (x). 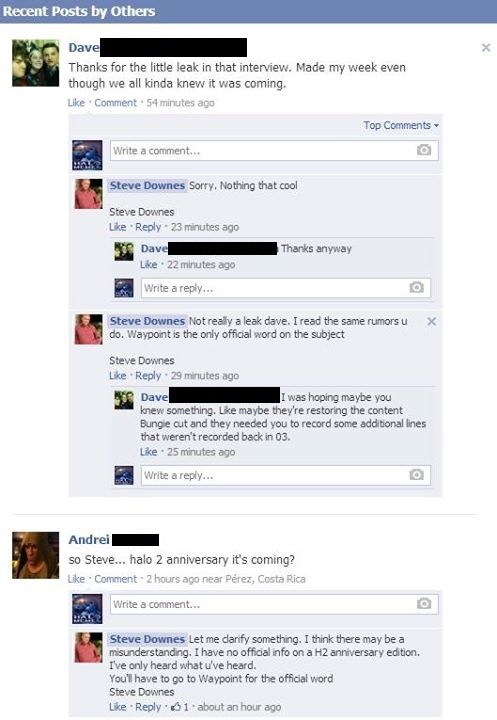 But apparently Steve Downes said on Facebook that he knows nothing more than us and that he based that response off of the rumours that we all hear about. Microsoft could be covering their tracks or perhaps Downes made a mistake. Who knows? So there you have it. What do you think of these rumors? Could McFarlane toys have the inside scoop or are they just taking preemptive measures and basing them off rumours? This entry was posted in Xbox One Articles and tagged Halo, Halo 2, Halo 2 Anniversary, Halo 2 Anniversary 2014, Halo 2 Anniversary News, Halo 2 Anniversary Toy, Halo 2 Anniversary Xbox One, Halo 2 Master Chief Prototype Toy, Halo Rumors, McFarlane toys, McFarlane Toys Halo 2 Master Chief, McFarlane Toys Halo on Xbox One Master Chief, Steve Downes, Xbox One by Chief Canuck. Bookmark the permalink.